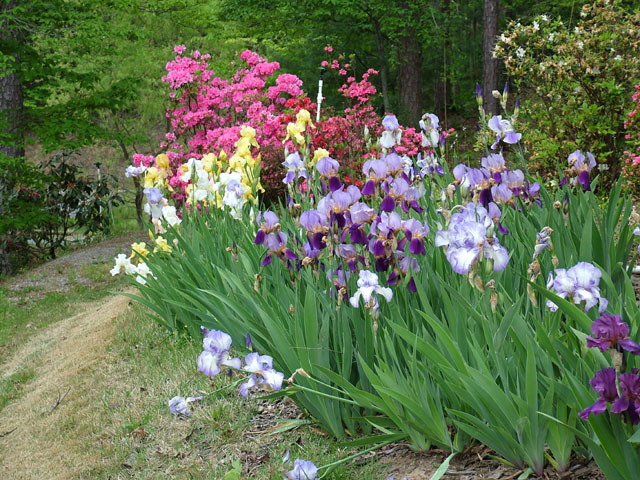 Enjoy a peaceful setting surrounded by acres of woodland and thousands of seasonal flowers. You can choose between a full home cooked buffet meal or a selection of hot and cold hors d'oeuvres, fresh fruit, veggie trays, cheese balls, or dips (see details below). Enjoy your meal in our new Ballroom which is available for year round weddings and receptions and other events. Reception guests may enjoy the tranquility and beauty of the Gardens during their visit. Perhaps you would like to have your Wedding at church and then come to Sunshine Hollow for an elegant Reception. Receptions include use of the 4000 square foot Ballroom, guest tables with linens and chairs for your guests. Light decorations in the Ballroom, Bride and Groom Table with chairs, Registration/Wedding Gift Table, Wedding Cake table (if we provide the cake) and a Punch table (if we furnish the punch). 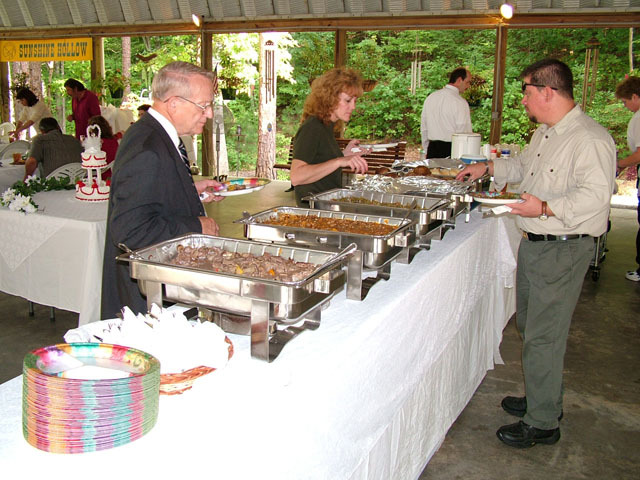 For a reception at noon or six in the evening where the food will be considered a meal by the attendees, we suggest one of our delicious buffets. You have many choices of delicious homemade entrees, side dishes and desserts. Items are prepared fresh and served hot from our adjoining Bakery kitchen. We have a wide range of foods available and we suggest adding an extra entree or dessert to make your meal even more enjoyable for those attending. Buffet Option One on our menu is only $12.95 per person (plus tax). We have gotten rave reviews for our food from not only Wedding Guests and Brides and Grooms but Wedding Photographers, Ministers etc. who attend many Weddings. For menus available, see our buffet page for details. We can provide various kinds of hors d'oeuvres. Some examples would be finger sandwiches and petite quiches, warm Italian meat balls in sauce, vegetable, cheese and fruit trays depending on your wishes. Some of these types of foods are priced per piece and some per person. The wedding reception party can decide which items and how much of each item to offer their guests. You must pick items totaling $12.95 or more for all the items furnished for the reception to be included at no cost. You may add more items at an additional charge. See our Hors d'oeuvres selection page for details. We specialize in three tier weddings cakes with your choice of flavors and real butter cream icing made with real butter decorated with fresh flowers such as Roses. Please see our Wedding Cake Photo Gallery. Prices for wedding cakes start at $2.50 per serving which is about half what you would pay at a traditional bakery plus there is no delivery and setup charge. We usually make Groom’s Cakes with Chocolate Ganache fillings and rich chocolate fudge icing and decorated with Strawberries in season or we make Coconut Cakes with real cream cheese coconut icing and filling and decorated with Maraschino Cherries. Groom’s cakes start at $75.00 and they are usually completely gone by the end of the reception. 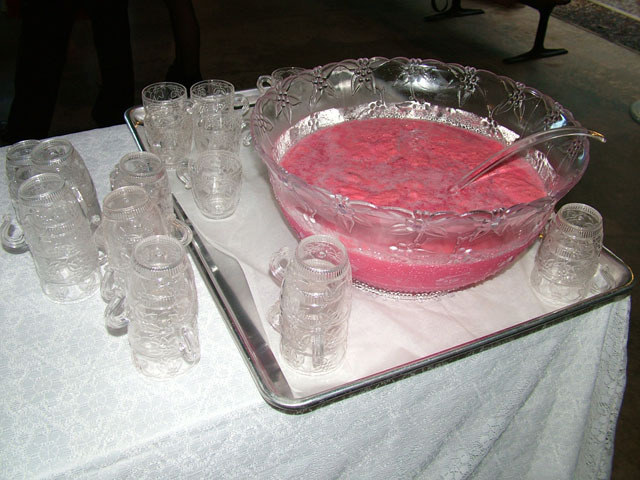 We can provide Wedding Punch for your reception. We make wedding punch in two different ways. Traditional Ginger Ale - Sherbet or our specialty Fruited Ice Tea made with orange and lemon juice and decorated with slices of the same with frozen punch decorations. If we are providing Punch for your wedding then we will also furnish a punch table, punch ladle, antique punch bowl, cups and napkins and serve the Wedding Punch. Sunshine Hollow will set up enough tables and white guest chairs (8 per table) for your party. Mid table length white linen table clothes are included for each table. Serving modules with linen and lace toppers for food items are included. 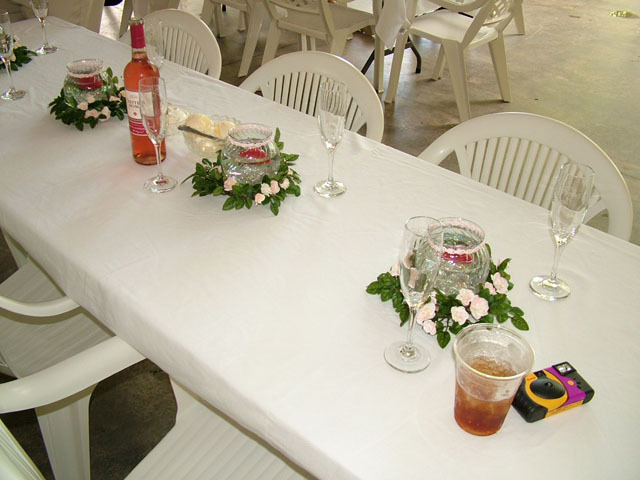 One 4'x4' punch serving table with white tablecloth & lace topper if punch is being served. One covered table for registration/wedding gift if desired. One Bride and Groom or Wedding party table with chairs. Sunshine Hollow will help with parking and direction of participants to site. We provide a full drink service for the entire reception. There is no need for the wedding party to bring drinks for their guests. We also provide several other additional services at extra charge. Minimum of 50 paid reception guests are required to receive reception benefits. Reception party must specify number of guests one week prior to event. Additional guests above that number will be charged the amount specified in the Reception Agreement. Please add 9% sales tax to all prices (all caterers, venue rentals are required to do the same). A standard gratuity of 15% will be added to all meal services before tax. Advanced deposit for receptions is 25% and is due one week before the reception. The deposit is non-refundable but will be deducted from the total event cost. Prices are subject to change without notice unless a contract is signed and a deposit is paid. Full payment due the day before the reception (less deposit). Sunshine Hollow reserves the right to approve use of favors, fireworks, table and pavilion decorations and items tossed at the bride and groom. Please discuss with us what you will be using prior to the Reception. Sunshine Hollow reserves the right to approve the consumption of alcoholic beverages at the reception. Anyone who is obviously intoxicated will be asked to leave the premises. No smoking is permitted in any buildings or restrooms. Please let others enjoy the clean air in the Gardens. If you want additional decorations, back drops, table flower arrangements & display stands you or your florist must provide these. The reception party or florist will remove same immediately after reception unless prior arrangements are made. Reception Party will need to provide any persons necessary to seat and handle guests such as ushers and greeters; also any persons to serve the wedding cake, musicians, photographers and others necessary for the reception. Please check out pictures from previous receptions in our Reception Photo Gallery. Version: a, April, 2006. Page generated 10:49 EDT; Saturday, April 20, 2019.